[Updated with 2012 federal poverty levels] 2012 poverty income levels have now been published. As discussed below, poverty guidelines and thresholds are two slightly different versions of the federal poverty measure. 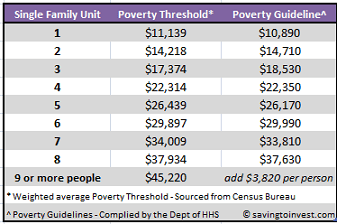 The poverty thresholds are provided by the Census Bureau and updated annually. Poverty guidelines, also updated every year, are provided by the Department of Health and Human Services (HHS). 2013 poverty guidelines will be available early next year. If this information is useful to you, consider subscribing (free) via RSS or Email to get the latest updates. [2010-2012 Poverty Guidelines and Thresholds] According to the Census bureau, the official poverty rate in 2010 (latest data) was up to 15.1 percent, versus 14.3 percent in 2009 and 13.2 percent in 2008. This translates to nearly 50 million Americans in poverty, up from 39.8 million in 2008 and is the fourth consecutive annual increase, a reflection of the poor economic climate the nation is enduring. Forecasts suggest the rate is likely to continue increasing as the nation struggles with high unemployment, anemic growth and a dysfunctional political system. 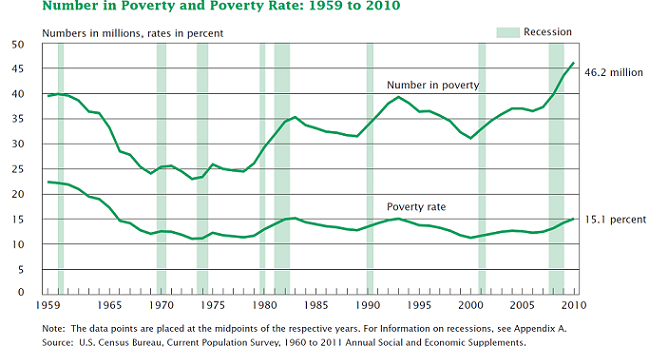 While the latest poverty rate, the highest since 1994, it is still 7.3 percentage points lower than the poverty rate in 1959, when poverty estimates were first available. Do you know what the income limits are to be officially be considered poor in this country? 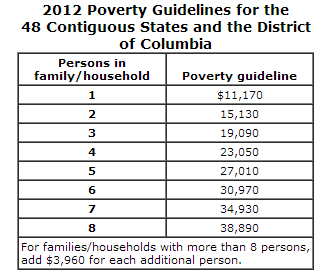 If not, then see the 2011 poverty threshold and guideline table below. The average American household (3 to 4 people) makes around $50,000 a year, so are well above the poverty line. However, with the recession and bleak unemployment picture many families this year may find themselves classified as “poor” according to official definitions. While there is little good in being poor in America, or anywhere else for that matter; the one silver lining is that if your family unit falls below or near these limits you may qualify for a number of federal and state assistance programs. Poverty thresholds are used for calculating all official poverty population statistics — for instance, figures on the number of Americans in poverty each year. They are updated each year by the Census Bureau. The poverty guidelines are a simplified version of the federal poverty thresholds used for administrative purposes – for instance, determining financial eligibility for certain federal programs. They are issued each year in the Federal Register by the Department of Health and Human Services (HHS). The poverty guidelines are generally based on gross (before-tax) income, but some agencies and programs do use the after-tax (net) income for determining if family units meet the poverty guidelines. So check with the specific agency/program. The poverty guidelines are more important primarily because a number of federal and state government programs use the guidelines (or percentage multiples of the guidelines — for instance, 125 percent or 185 percent of the guidelines) in determining eligibility. This includes Head Start, the Food Stamp Program (now known as SNAP), the National School Lunch Program, the Low-Income Home Energy Assistance Program, and the Children Health Insurance Program. Note that in general, cash public assistance programs (Temporary Assistance for Needy Families and Supplemental Security Income) and Earned Income Tax Credit program do NOT use the poverty guidelines in determining eligibility. Note: Even though there is an official federal definition of “poverty,” the federal government doesn’t have an official definition for income or wealth classifications that make up middle class, middle income, rich, or upper income.